Dr. Lauren Narvaez Van Winkle, O.D. Home » Our Doctors » Dr. Lauren Narvaez Van Winkle, O.D. 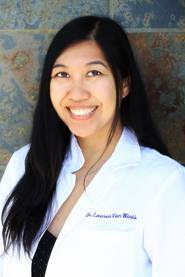 Dr. Lauren Narvaez Van Winkle, O.D. was born and raised in Southern California. She attended the University of California, Irvine and received a Bachelor’s degree in Biology. After she earned her Doctor of Optometry degree from the Southern California College of Optometry, she relocated to the Sacramento area with her family. Her extensive training in optometric care includes professional internships at the VA Medical Center of West Los Angeles, VA Ambulatory Care Center of Los Angeles, and the Optometric Center of Los Angeles. She is a member of the American Optometric Association, the California Optometric Association and the Sacramento Valley Optometric Society. In her free time, she likes to see the world with her husband, her 6 year old daughter and her 3 year old son. They love to go to the beach, the mountains and cruise the city for good eats. They enjoy nature in any way they can, whether it be hiking, kayaking, biking or snowboarding. She also loves to travel, learn about different cultures and photograph people and places.